فازت صورة لضفدع التقطتها مصورة بريطانية بالجائزة الأولى في مسابقة دولية للتصوير الفوتوغرافي، التي شهدت مشاركة صور عديدة كانت الحيوانات محورها من الضفادع الغريبة إلى الثعالب القافزة. وحصلت المصورة ميشيل هاول على الجائزة الكبرى بصورتها التي أظهرت الضفدع الأرجنتيني المزخرف، الذي يبدو غريب الشكل كما يظهر في الصورة. **EMBARGOED UNTIL 00.01HRS, JULY 17, 2017** Highly commended – Peacock tree frogs. 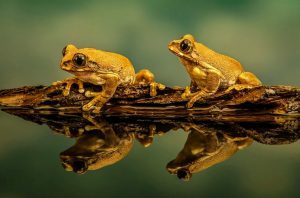 From exotic frogs to a jumping fox, all these pictures are winners and runners up in an international photography competition. See NATIONAL story NNWILD. British snapper Michelle Howell grabbed the top prize with this pic of a colourful Argentinian Ornate Horned Frog. She fought off more than 530 other snappers to win the Society of International Nature and Wildlife Photographers’ Creatures Great and Small competition. Former cop Michelle, from Flockton, Yorkshire said: “After retiring from West Yorkshire Police and entering the sailing business, I renewed my previous passion for photography. وخاض المنافسة أكثر من 530 من المنافسين للفوز بجائزة جمعية الطبيعة الدولية ومصورات الحياة البرية للمخلوقات الكبيرة والصغيرة. 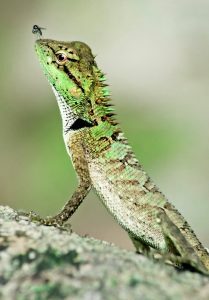 **EMBARGOED UNTIL 00.01HRS, JULY 17, 2017** Highly commended – Thai lizard with fly on its nose. From exotic frogs to a jumping fox, all these pictures are winners and runners up in an international photography competition. See NATIONAL story NNWILD. British snapper Michelle Howell grabbed the top prize with this pic of a colourful Argentinian Ornate Horned Frog. She fought off more than 530 other snappers to win the Society of International Nature and Wildlife Photographers’ Creatures Great and Small competition. Former cop Michelle, from Flockton, Yorkshire said: “After retiring from West Yorkshire Police and entering the sailing business, I renewed my previous passion for photography. والمصورة الفائزة هي ضابطة شرطة متقاعدة من فلوكتون بيوركشاير، وقالت إنها بعد التقاعد من الشرطة في غرب يوركشاير دخلت عالم البحار، ومن ثم جددت شغفها السابق مع التصوير الفوتوغرافي. 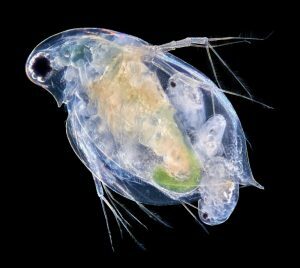 **EMBARGOED UNTIL 00.01HRS, JULY 17, 2017** Highly commended – Daphnia giving birth. From exotic frogs to a jumping fox, all these pictures are winners and runners up in an international photography competition. See NATIONAL story NNWILD. British snapper Michelle Howell grabbed the top prize with this pic of a colourful Argentinian Ornate Horned Frog. She fought off more than 530 other snappers to win the Society of International Nature and Wildlife Photographers’ Creatures Great and Small competition. Former cop Michelle, from Flockton, Yorkshire said: “After retiring from West Yorkshire Police and entering the sailing business, I renewed my previous passion for photography. وأضافت: “لقد سمحت لي أعمال البحار بالسفر على نطاق واسع في كل أنحاء العالم، وسنحت لي الفرصة لتصوير العالم من حولي”. 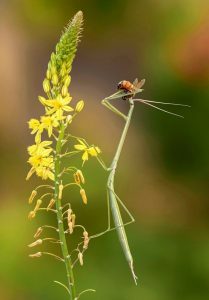 **EMBARGOED UNTIL 00.01HRS, JULY 17, 2017** Highly commended – Stick mantis and bee. From exotic frogs to a jumping fox, all these pictures are winners and runners up in an international photography competition. See NATIONAL story NNWILD. British snapper Michelle Howell grabbed the top prize with this pic of a colourful Argentinian Ornate Horned Frog. She fought off more than 530 other snappers to win the Society of International Nature and Wildlife Photographers’ Creatures Great and Small competition. Former cop Michelle, from Flockton, Yorkshire said: “After retiring from West Yorkshire Police and entering the sailing business, I renewed my previous passion for photography. وأوضحت أنها تعشق تصوير الطبيعة والحياة الدقيقة بشكل عام. 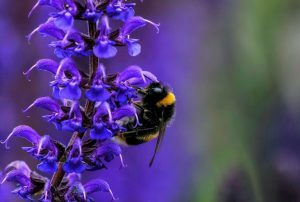 Third place – Bee on lavender. 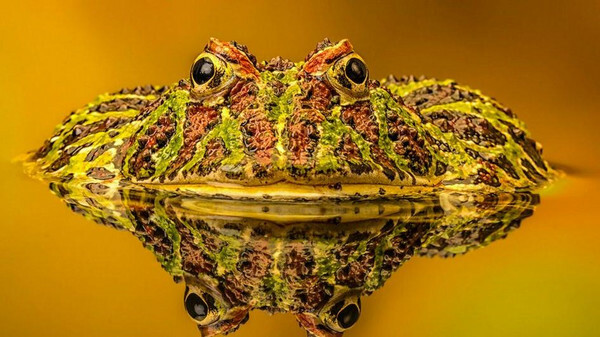 From exotic frogs to a jumping fox, all these pictures are winners and runners up in an international photography competition. See NATIONAL story NNWILD. British snapper Michelle Howell grabbed the top prize with this pic of a colourful Argentinian Ornate Horned Frog. She fought off more than 530 other snappers to win the Society of International Nature and Wildlife Photographers’ Creatures Great and Small competition. Former cop Michelle, from Flockton, Yorkshire said: “After retiring from West Yorkshire Police and entering the sailing business, I renewed my previous passion for photography. وجاءت في المركز الثاني المصورة شيري إيمرسون من نيوفاوندلاند بكندا، بصورة مثيرة لحيوان الكركدن وسط الغبار. 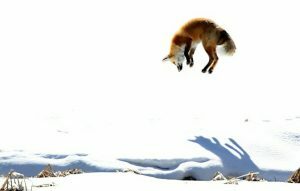 Highly commended – Jumping Fox. From exotic frogs to a jumping fox, all these pictures are winners and runners up in an international photography competition. See NATIONAL story NNWILD. British snapper Michelle Howell grabbed the top prize with this pic of a colourful Argentinian Ornate Horned Frog. She fought off more than 530 other snappers to win the Society of International Nature and Wildlife Photographers’ Creatures Great and Small competition. Former cop Michelle, from Flockton, Yorkshire said: “After retiring from West Yorkshire Police and entering the sailing business, I renewed my previous passion for photography. فيما ذهب المركز الثالث إلى ستيوارت ووكر، لصورة النحل وهو يمتص رحيق الأزهار. 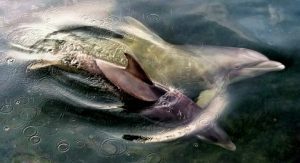 **EMBARGOED UNTIL 00.01HRS, JULY 17, 2017** Highly commended – Florida Dolphins. From exotic frogs to a jumping fox, all these pictures are winners and runners up in an international photography competition. See NATIONAL story NNWILD. British snapper Michelle Howell grabbed the top prize with this pic of a colourful Argentinian Ornate Horned Frog. She fought off more than 530 other snappers to win the Society of International Nature and Wildlife Photographers’ Creatures Great and Small competition. Former cop Michelle, from Flockton, Yorkshire said: “After retiring from West Yorkshire Police and entering the sailing business, I renewed my previous passion for photography.